Will the Church have to endure any part of the Tribulation? 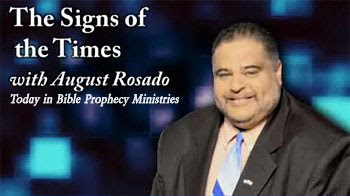 August Rosado: The Jewish people are back in their own homeland against all odds in preparation for Daniel's 70th Week of Prophecy. Now, when I say Daniel's 70th Week of Prophecy, I am referring to a future seven year period of tribulation that will come upon this world. I am reminded of Daniel 9:24 where God says, "Seventy weeks I determined upon thy people and upon thy holy city." "Thy people" is a reference to the Jewish people, and "thy holy city" is a reference to the City of Yerushaláyim in the Hebrew which we know as the city of Jerusalem. As a matter of fact, Jeremiah 30:7 tells us that the Tribulation period will be a "time of Jacob's trouble." He didn't say it was the "time of the Church's trouble." He didn't say it was the "time of the Christian's trouble." No, it is indeed a time of Jacob's trouble. I am convinced that we will not be here when Daniel's 70th Week of Prophecy begins on this earth. I am reminded of a Pre-Tribulation Rapture of the Church. I am reminded of what Paul said in Romans 5:9, "Much more then, being now justified by his blood, we shall be saved from wrath through him." And, 1 Thessalonians 1:10 tells us, "That we are to wait for his Son from heaven, whom he raised from the dead, even Jesus, who delivers us from the wrath to come." That is future tense — "from the wrath to come." I am also reminded of 1 Thessalonians 5:9 where it says, "For God hath not appointed us unto wrath, but to obtain salvation by our Lord Jesus Christ." And, who can deny the words of Yeshua Himself the Lord Jesus in Revelation 3:10, "Because thou hast kept the word of my patience, I will also keep thee from the hour of temptation that shall come upon all the world to try them [not us] but to try them who dwell on the earth." It is the proof of the pudding that we as a Church will not be here on this earth when that final week of Daniel's 70th Week of Prophecy transpires, that last seven year period of tribulation that will come upon this world. I am convinced we will not be here. The Jewish people are back in their homeland, but they are back in unbelief. They must be back in unbelief in preparation for that future seven year period of Tribulation to come upon this world. It will be during that seven year period of Tribulation that the Jewish people will come to faith in Yeshau Hammashiach — Jesus the Messiah and Son of God. The Bible tells us that the very end of the Tribulation period, Jesus Christ will return back to this earth at His Second Coming. Recorded in Revelation 19:11-16, John described, "I saw Heaven open and behold a white horse and He that sat upon Him was called faithful and true. And in righteousness doth He judge and make war. His eyes were as a flame of fire; upon His head were many crowns; He had a name written that no man knew but He Himself. And He was clothed with a vesture dipped in blood and His name was called the Word of God." Church, this is where we come in, in verse number 14, "And the armies which were in Heaven followed Him upon white horses, clothed in fine linen clean and white." That will be the Church that was Raptured just seven years earlier. We are coming back with Him seven years later. The Bible says in Revelation 19:15 that, "Out of His mouth goeth a sharp sword, that with it He should smite the nations: and He shall rule them with a rod of iron: and He treadeth the winepress of the fierceness and wrath of Almighty God." Revelation 19:16 says, "Upon his vesture (His prayer shawl, His tallit) upon His vesture and upon His thigh was a name written, 'King of Kings, and Lord of Lords.'" I'm telling you that on the day our Messiah is coming back as the King of Kings and the Lord of Lords that we are coming back with Him. Where will Jesus be coming to? He is returning to the nation of Israel. He is coming back to the city of Jerusalem. Zechariah 14:4 tells us that one day His feet will touch the Mount of Olives and the Mount of Olives is going to split. Zechariah 12:10 tells us, "I will pour upon the house of David and upon the inhabitants of Jerusalem the Spirit of grace and supplication; and they shall look upon Me whom they have pierced and they shall mourn for Him as one who mourns for his only son, and shall be in bitterness for him, as one that is in bitterness for his first born son." That is a Second Coming passage about Christ's return to this earth. John reiterates this in Revelation 1:7 where he says, "Behold, He cometh in the clouds and every eye shall see Him and they also which pierced Him. And all the kindreds of the earth shall wail because of Him, even so Amen." What does that mean? It means that when Jesus returns at His Second Coming Israel will indeed know it, and they will look at Him and say, "Oy vey! He was the Messiah after all. How could we have missed it for the past 2,000 years?" That will take place at His Second Coming, and we are coming back with Him. So, that's the reason why God has put the Jewish people back in their own homeland. It's in preparation for that future seven year period of Tribulation that will soon come upon this world. But, before there can be a Battle of Armageddon, and before there can be a Second Coming of Jesus, and before there can be a seven year period of Tribulation, and before there can be a confirmation of a peace treaty by the Antichrist, the Bible says there must be the Rapture of the Church. In 1 Corinthians 15:51-52 Paul says, "Behold, I show you a mystery; We shall not all sleep, but we shall all be changed, in a moment, in the twinkling of an eye, at the last trump: for the trumpet shall sound, and the dead shall be raised incorruptible, and we shall be changed." I am reminded of 1 Thessalonians 4:16-18, "For the Lord himself shall descend from heaven with a shout, with the voice of the archangel, and with the trump of God: and the dead in Christ shall rise first: Then we which are alive and remain shall be caught up together with them in the clouds, to meet the Lord in the air: and so shall we ever be with the Lord. Wherefore comfort one another with these words." Now, why would Paul tell us as a Church "to comfort one another with these words?" I'll tell you why, because we will not see one day of that seven year period of Tribulation that will come upon this world. Between Revelation chapters 4 and 19 there is no reference to Christians being on the earth, and there is no reference to the Church being on the earth. We will be in Glory. In Heaven during the Tribulation, we are going to partake in the Marriage Supper of the Lamb. Revelation 19:7-8 describes this, "Let us be glad and rejoice and give honor unto Him for the Marriage of the Lamb has come and His wife hath made herself ready. And to her it was granted that she should be arrayed in fine linen, clean and white, for the fine linen is the righteousness of the saints." There is going to be a beautiful banquet in Heaven one day, and if you know Jesus Christ as your Lord and personal Savior you will also be there at that wedding banquet. Amen! When we come back with Jesus, we will be riding on white horses. I remember being in Canada a couple of years ago preaching at a prophecy conference and I can remember riding this beautiful white horse. When I got on that horse I was reminded of Revelation 19:14, "That the armies which were in Heaven followed Jesus upon those white horses clothed in fine linen clean and white." Remember where Jesus is coming back to? Jesus is coming back to Israel, specifically to the city of Jerusalem, and the Bible says that from there we will reign with Him for a thousand years. In Revelation 20:2-7, six times John tells us He will reign for a 1,000 years... a 1,000 years... a 1,000 years... a 1,000 years. This time will see a literal, bodily, physical reign of Jesus Christ right here on good old terra firma from the city of Jerusalem in the land of Israel. For a thousand years we're all going to be Israelis. Amen? Why would you want to miss out on the most important event that will ever take place? It is still yet to come, this Rapture of the church. Philippians 3:20-21 tells us, "For our conversation is in Heaven, from whence we also look for the Savior the Lord Jesus Christ: who shall change our vile body, that it might be fashioned like unto His glorious body according to the work whereby He is able to subdue all things unto Himself." One day Jesus is going to change our vile bodies that they may be fashioned like unto His glorious body. The Bible then tells us that in a moment, in the twinkling of an eye, we are going to be in His very presence because at the Rapture we are going to meet Jesus in the air. He doesn't touch down anywhere on the earth. But, seven years later at His Second Coming, Zechariah 14:4 says, "That on that day His feet shall touch the Mount of Olives, which is before Jerusalem on the east, and the Mount of Olives shall cleave in the midst thereof towards the east and toward the west and there shall be a very great valley; half the mountain shall remove toward the north, and half toward the south." I am reminded of Jesus' words in Matthew 24:27, "As lightening cometh from the east and shineth even unto the west, so shall also the coming of the Son of Man be." Israel is mentioned 2,466 times in our Bible and God has a plan for Israel. He has a plan for the Jewish people. The Church has never and will never replace Israel. God has a plan for the Church that He is fulfilling right now during the Church Age, and He has a plan for the nation of Israel that He will fulfill in that future seven year period of Tribulation that will come upon this world. One prophecy preacher put it this way, "When you see the signs for Christmas appearing in your department store, you know that there is another holiday that is even nearer, and that is Thanksgiving. When you see the signs for that upcoming seven year period of Tribulation coming upon this world, we then know that there is another event that is even nearer, and that is the Rapture of the Church." Every single day that goes by is a day closer to the return of Jesus Christ. All I am going to say to that is "Maranatha, even so come, Lord Jesus!" If you don't know Jesus Christ as your Lord and personal Savior, I pray that today would be the day of salvation. Trust in Jesus Christ as your Lord and personal Savior and you'll be ready for that next event we call the Rapture of the Church. Maranatha, even so come, Lord Jesus! Shalom. Before there can be Rapture of the Church there must be a transition point established, where the Spirit of God is restored upon Israel. This transition point occurs after the Gog/Magog battle of Ezekiel 38-39. Identified within this prophecy is the fact that the Lord will pour out his Spirit upon the House of Israel. "The first shall be last, and the last first". Many scholars embrace Israel as if they are without sin, yet Israel even today exists in open rebellion. For this reason the Lord God is preparing to bring many nations against his people and against his land. Though Israel will be delivered out of the hands of the Gog/Magog invasion force, it is not for their sakes, it is to glorify the name of the Lord God that has been profaned among the nations by Israel. The Lord God has allowed Israel to put on the garments of false confidence and false security, that he might reveal himself to his people and judge the nations. While the nations will know the fury and mighty hand of the Lord, they too will acknowledge the soveriegnty of the Lord God. It will be a day when the Lord God will be glorified. The preparations have been made and very soon they will begin to mass on Israel's borders. The summer of the indignation of the Lord draws near. In the aftermath, the Lord God will plead with Israel as was done with their Father's in the wilderness. The Passover will also have new meaning, for the Lord God will with an outstretched arm and much fury poured out, gather all Israel, and none will be left behind in the lands of their enemies. If you still want to gamble with a limited conflict of an IDF victory under the auspices of a modern Psalm 83 conflict as portrayed in Isralestine, you will lose to the House on that one. North Africa and the entire Middle East is in preparation for war and 60 million barrels of oil will not stop this progression. The European Union and the United States are teetering on the brink of insolvency as their perspective economies collapse under the weight of spectacular debt. The globe is becoming more unstable by the day, further proof, that something momentous is about to occur. Elijah the Prophet was an example of the Church as he was caught up to Heaven in the presence of the Lord, so too the Church. Prior to this however it is required that the mantle be given to Elisha represented by Israel. Israel will receive a double portion in the form of the Two Witnesses of Revelation 11. I guess you don't believe in an imminent rapture, huh? Because if you did, then you wouldn't be saying that X must happen before the rapture occurs. Rodney said "If you still want to gamble with a limited conflict of an IDF victory under the auspices of a modern Psalm 83 conflict as portrayed in Isralestine, you will lose to the House on that one." Rodney, I completely agree with you on that. So far I have not read anything to convince me that the Psalm 83 conflict AS PORTRAYED IN ISRALESTINE is fact. Anonymous you are correct in that assumption, the Apostle Paul makes it clear that first must come the falling away (Apostacy) and the initial revealing of the AntiChrist or Son of Perdition. If we are to assume that we are to be kept from the wrath to come, then obviously events and circumstances must progress to the point in which the Lord is about to pour out his wrath. Much like the situation with Noah and with Lot. There would also be a required transition to allow for Israel to again carry the message as the Word of God plainly identifies that the Spirit of God will be poured out upon them. Anonymous, you are free to believe as you will, in the end it will however not matter. I personally like to read the scriptures myself and not rely on information presented by others as fact. Billy, I appreciate that statement, too bad we can not get others to wake up! Anonymous, by the way, I think I will chose to believe one that was caught up to the third heaven and seen indescribable and unspeakable majesty, whether he was in the body or out of the body, he was not sure, however, the Apostle Paul has proven himself before men and God as being reliable and trustworthy.